Question: I’m a PAYE worker. What income tax will I pay in 2019? Answer: The amount of tax that you have to pay depends on your personal circumstances. Tax is charged as a percentage of your income. The percentage that you pay depends on your income. The first part of your income, up to a certain amount, is taxed at 20%. This is known as the standard rate of tax and the amount that it applies to is known as the standard rate tax band. If you have income above the standard rate tax band, it is taxed at the higher rate of tax, which is 40%. The amount that you can earn before you start to pay the higher rate of tax is known as your standard rate cut-off point. You may also be eligible for other income tax reliefs, credits or exemptions, which can reduce the amount of tax that you have to pay. Visit revenue.ie to find out more. • Know Your Rights has been compiled by Kerry Citizens Information Service which provides a free and confidential service to the public. 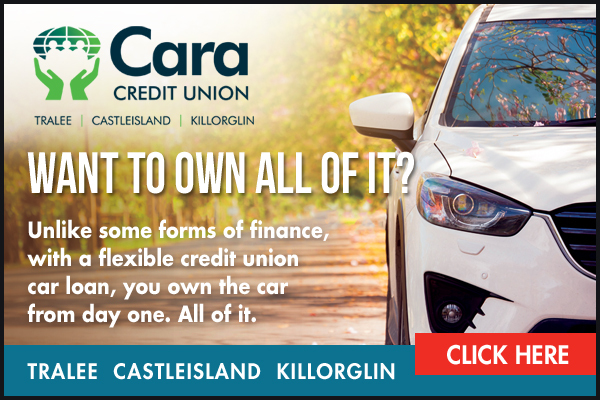 Contact us in Tralee on Tel: 0761 07 7860 Killarney 0761 07 7820, Listowel 0761 07 7840 Kenmare 0761 07 7810, & Caherciveen 0761 07 7780. 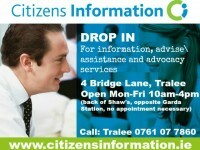 Outreach Services; Killorglin weekly, Dingle monthly, please call Tralee for more information.